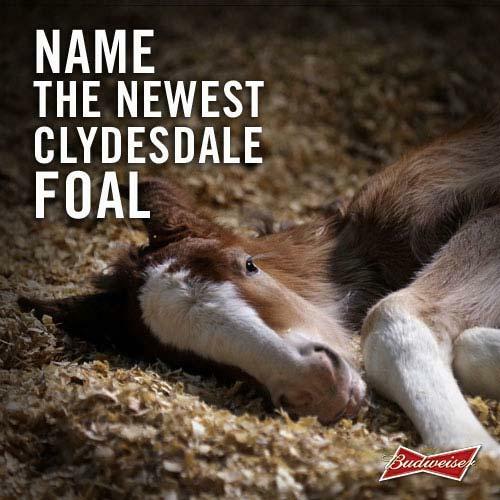 The star of this years Budweiser Super Bowl commercial will be a newborn Clydesdale. 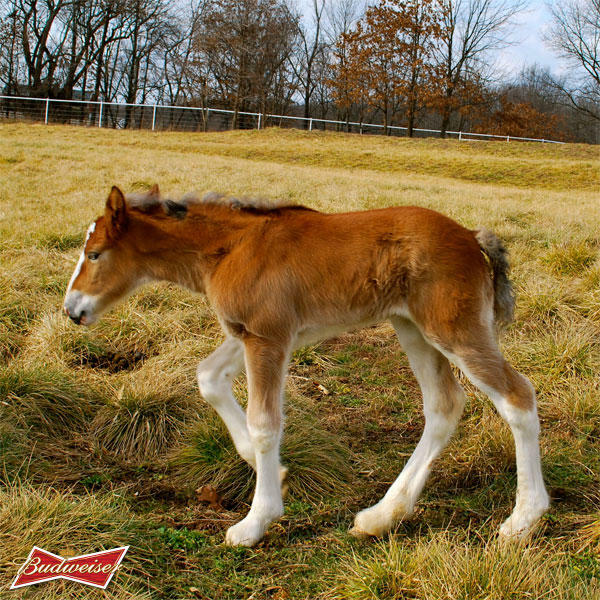 The 60-second Super Bowl ad chronicles the bond a Clydesdale foal shares with his trainer. It marks the 23rd Super Bowl ad featuring the Clydesdales. 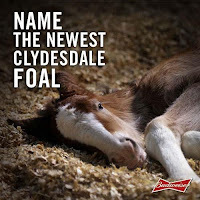 Budweiser has launched its first-ever Twitter account that went live this past Sunday, and used the occasion to tweet the first photo of the newborn and are taking name suggestions. CBS this evening (1/30) aired a show featuring Super Bowl Ads you'll be able to see this Sunday and one of them was a short clip of this ad with "Landslide" playing in the background. I'm assuming that "Landslide" will follow in the full ad when it airs on Sunday. Kinda cool! Watch The Super Bowl this Sunday for the 60 sec. spot. Thanks @N8Curlen and @MYarr for the heads-up! Advertisers are paying upwards of $3.7 million just to air their spot during the big game, major synchs can fetch anywhere from $100,000 to upwards of $1 million, depending on the artist, number of territories airing the ad, the length of the commercial "flight," or airtime, and whether the song has been synched previously. The spot, directed by Jake Scott, shows the animal growing older—until its breeder must hand it over to the folks at Budweiser. The ad then jumps ahead three years, as the breeder reads in the newspaper that the Clydesdales will be visiting his area. Hoping for a reunion, he goes to the parade. You can guess what happens from there. It's a poignant and well-shot commercial—in keeping with some of the better Budweiser ads through the years—made all the more evocative by the use of Fleetwood Mac's "Landslide." from the 1975 "Fleetwood Mac" album. Interesting. Fleetwood Mac are everywhere now. I read on Yahoo that some of the Super Bowl ads are selling for $4-6 million USD. I wonder how much of a chunk Stevie will get for this. It's on YouTube...grab a kieenex!!!! Lets petiton for fleetwood mac to play at the superbowl next yr for the halftime entertainment. The only thing is that its in NJ at metlife stadium an outdoor event. I will be chilly to say the least. So don't know if the mac will even go for that next yr but maybe down the road in a near future superbowl. Why do they cut songs like this? It doesn't make sense and it sounds ridiculous. But right on, for using the song. I think. Great publicity, questionable use of the song. The words and visuals don't complement each other particularly well, but hey, why not introduce the song to a new audience every decade or so? Great that millions of people will hear Stevie's voice in it's pristine state in the sound that made her a star. Really smart song editing would have been to omit the "I took my love, took it down", and just played the 2-bar guitar intro before the chorus, while showing the guy and the foal, with the opening lyrics being "...I've been afraid of changing... 'cause I've built my life around you". By then we would have gotten the story. It would have been much more touching, and have made better sense. Even a stranger to this song (like yeah, right!) would known it had been poorly cut-and-pasted together... which diminished the song's purposeful meaning. OMG - analyzing the editing of a song to point out how to give a budweiser commercial "more meaning"? It's a commercial for beer. Well then they HAVE to name it Stevie!!!! It doesn't cut it that when the "snow covered hills" lyric is being sung, we see the horse running down a New York City street. Snow covered hills? It's a literal image that's hard to get around. And as to the person who wishes "I had enough leisure time" to analyze the editing but does have the time to compose a post criticizing and/or ridiculing others who do - you're the one who sounds petty and unimaginative. Sad - I have never seen Stevie's music used to sell products before. So now people will associate a beautiful song with a beer - tragic!! !